Get the basics on menus. 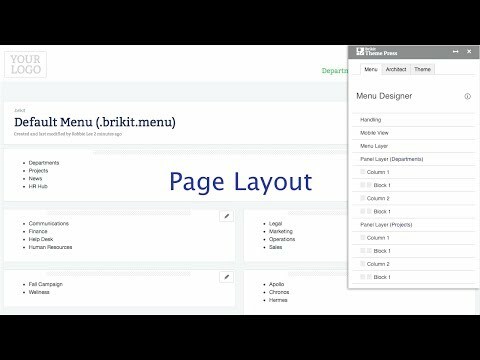 A custom menu allows you to create site navigation specific to your company's needs, directing your users and defining the relevancy of your pages and site hierarchy. The menu appears in the canvas header. Your information architect sets the the menu page for a particular space. A menu always consists of top-level items. A menu may consist of dropdowns (one-level) or panels. Theme Press ignores top-level links when the top-level item has a dropdown or panel. To edit a menu page, complete the following instructions. Access the Theme Press Default space. Select a menu page in the page tree. When viewing a menu page, you can see the Menu tab in the Designer. Notice that the layout options in this tab are a bit different from the other architect pages. For instance, instead of the Layer <#> accordion, you see Menu Layer and Panel Layer (<layer_name>). The tabs below provide information about these features. Styles you set in the Menu tab may override styles set in the Theme tab.